Intimidated by diabetes meal planning? 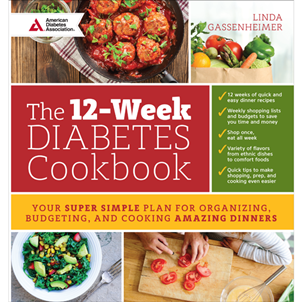 The 12-Week Diabetes Cookbook takes the guesswork out of planning and eating well with diabetes. Inside, you'll find everything you need to shop for, budget for, and cook 12 weeks of incredible, diabetes-friendly dinners. Detailed shopping lists allow you to shop just once for a full week of satisfying dinners, and weekly menus and cooking tips make it even easier to plan and prepare your meals. Indulge in a variety of delicious dinners including classic comfort foods, such as Spaghetti and Meatballs or a Tuna Melt with Sautéed Green Beans, and more exotic dishes like Chicken Tikka Masala with Caraway Rice or Beef Fajitas with Corn Salad. Each recipe makes four servings, so you'll have plenty for your family or leftovers to enjoy the next day. The 12-Week Diabetes Cookbook takes care of the hard work so you can enjoy stress-free, healthy meals every night of the week. I LOVE this book! It's not only a great cookbook with great and simple recipes but it has shopping lists for each week in the categories the items are found in the grocery store, it has approximate cost of each meal and of total groceries for the week, it has per person cost, even suggestions for what to do with left over ingredients. Even the recipes are given in specific amounts so you will know exactly how much it calls for in case you have some of the ingredients already so you know if you have enough! I wish there were sequels to this exact book written exactly like this one!! !